The NEW Somfy Z-Wave®to RTS (Radio Technology Somfy®) Interface (ZRTSI) is a Z-Wave bridge controller that receives Z-Wave transmissions and tranlates them to motor control commands for Somfy's entire range of RTS motors. The ZRTSI resides as a bridge controller node within a Z-Wave Network and becomes a repeating node in a mesh network. The ZRTSI also features Network Wide Inclusion (NWI) which allows inclusion and exclusion to take advantage of the mesh topology of Z-Wave networks. Z-Wave devices from all manufacturers can be used in the same network together. The ZRTSI has 1 base node and 16 virtual nodes. The 16 virtual nodes correspond to 16 RTS channels that once programmed to the ZRTSI, duplicate all settings associated with each channel of RTS motor control within Z-Wave networks. The ZRTSI requires 110V AC power and can be plugged into any standard outlet. Somfy recommends one ZRTSI be used for each 25' to 35' area where RTS motors are present. Note...Please Read! : All motor travel limits MUST be set prior to adding them to the ZRTSI. This means that all motors MUST be programmed to a Somfy Telis Remote or DecoFlex Switch before adding to the ZRTSI. Once this is accomplished you can then "Copy and Paste" the different motor channels to the ZRTSI Virtual Node channels. 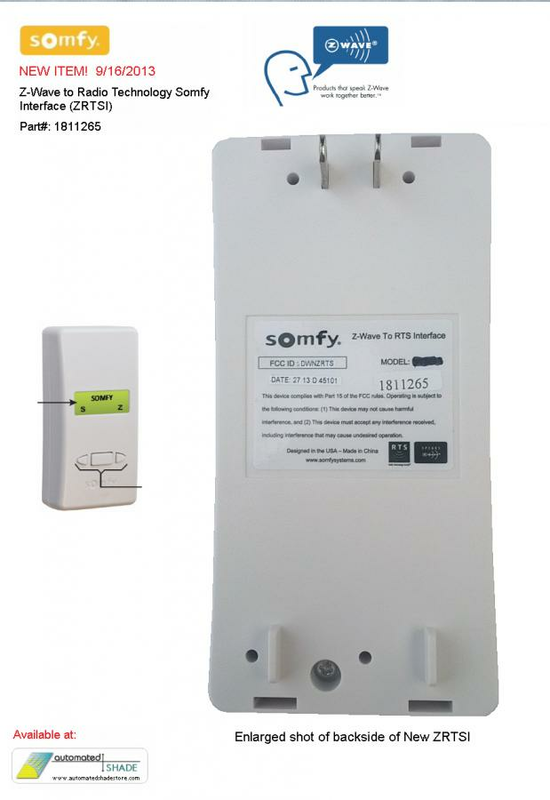 The Somfy ZRTSI is a static controller and cannot provide feedback to the Z-Wave system. You cannot set motor limits with the ZRTSI. Once the ZRTSI is programmed and you find that some of the motors that are incorporated into the ZRTSI do not respond, then try moving the ZRTSI to a different wall outlet for possibly better RF reception. Try moving the motor's antenna forward into the room.The maximum reliable operating range for this unit is around 30-35 Ft depending on obstructions and RF interference. If using a ZRTSI to control Somfy WireFree Tilt motor for 2" blinds, set the travel limits of slats so Down/Off = Open and Up/On = Closed or Visa-Versa. The 2" Blind slats have two "Closed" positions (Slats tilted all the way up or all the way down). You will have to choose one or the other as "Closed" so the slats will travel 90 Degrees...not 180. Since the ZRTSI provides no feedback, the switch dimming option (if present) will not work for variable slat tilting. If controlling multiple blinds, experiment with one before programming many. You cannot send a "Stop" command (My Preferred Setting) or "Stop" either...only On or Off...which corresponds to Up or Down. You will still have complete control of the motors with the Telis Remote or DecoFlex wall switch in addition to ZWave Control. Some ZWave controllers allow custom porgramming in which a "Stop" command can be issued. Pressing "Stop" while the blinds are in motion will Stop them, pressing a "Stop" command while the blinds are at rest will send the blinds to a "My" or Preferred setting if one has been previously programmed.